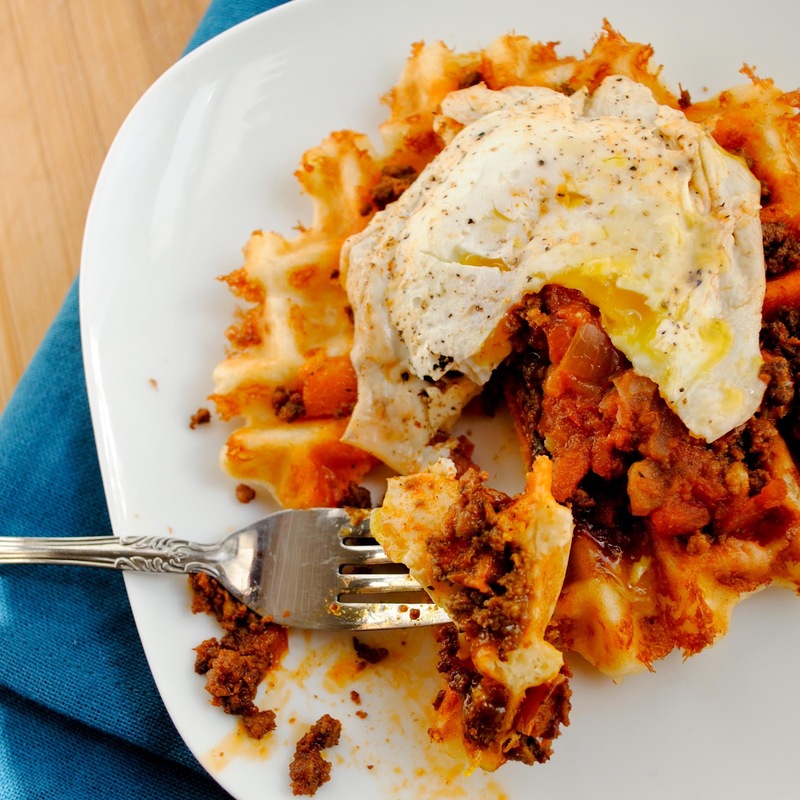 These golden, cheesy, fluffy, buttery waffles are topped with chorizo, salsa, and a dippy fried egg. It’s brinner perfection. What a lovely idea. Eating pancakes after noon. Nibbling on muffins at 6 PM. Digging into a hearty omelet after work. There’s perhaps no dinner I like more than breakfast. Which is why it totally baffles me that I never thought to make savory waffles. Thank goodness there are much smarter people out there in the world–like this girl–that pioneered the way to my ultimate brinner waffle feast. Otherwise I may have never known the happiness of waffles for dinner. So you want to know how this sweet breakfast treat gets transformed into a savory vehicle for dinner awesomeness? The secret is cheese. Handfuls of glorious cheese. And maybe some butter also (hey, I didn’t say brinner was healthy). The waffles grill up perfectly, browning around the edges, and leaving little swizzles of burnt cheese on the edges (that’s my favorite part!). And the smell. Don’t even get me started on the smell! It’s enough to make any girl abandon her skinny jeans in favor of some elastic waistband sweat pants. Worth. it. 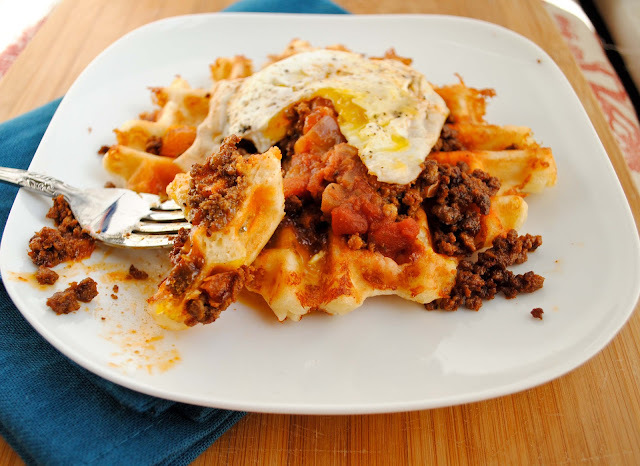 I chose to take these golden, cheesy, fluffy, buttery waffles and top them with chorizo, salsa, and a dippy fried egg. Friends, this is a game changer. The waffle has now become my ultimate delivery vehicle for all sorts of brinner concoctions. Stuffed with brie and topped with apple slices and proscuitto, it becomes sophisticated. Top with fresh greens and balsamic dressing and it takes a healthy spin. Or layer with peppers, onions and cilantro and you’ve got a simple, vegetarian delight. I don’t really care how you top it. Just make. these. waffles. Do it! Yield: This makes 4 normal size waffles but they’re very filling! The Mr. and I only finished about 2/3 of ours so I suggest making them a little smaller and getting six servings out of the deal. 1. Heat your waffle iron to medium high. In a large bowl, whisk together flour, baking powder, salt, and sugar. 2. 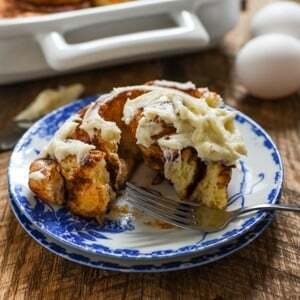 In a small bowl, whisk together buttermilk, egg, butter, and cheese. Add to dry ingredients and stir until well combined. 3. Grease waffle iron with butter or cooking spray. Drop 1/2-2/3 cup batter onto hot iron and press down. Cook for 4-7 minutes or until browned and crispy on the outside. Remove to a cookie sheet and keep finished waffles warm in a 250 degree oven. 4. Meanwhile, brown chorizo in a skillet over medium heat. Add peppers and saute until softened, about 3 minutes. 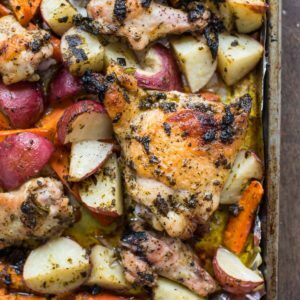 Remove from skillet and wipe out or drain excess fat. 5. If needed add an additional teaspoon or two of oil or butter to the skillet. Crack eggs into skillet and cook over medium heat until white is cooked almost all the way through, but yolk remains runny. Carefully flip eggs and cook an additional 45 seconds or so, just until the “skin” on the other side is cooked. Remove from skillet. 6. To assemble, place waffles on a plate. Top with chorizo pepper mixture, salsa, and fried egg. Sprinkle with salt and pepper. Who doesn’t love burnt cheese. I’m not a girl but I will break out my elastic shorts this weekend. It’s hot in AZ!